This entry was posted on Thursday, October 23rd, 2014 by Frances Ryan. I woke up at 6.30 on Sunday morning. The rain was dumping down like mad and I didn’t want to move. I didn’t want to start the day. I wanted to roll over and go back to sleep. I was, to say the least, feeling a bit underwhelmed. 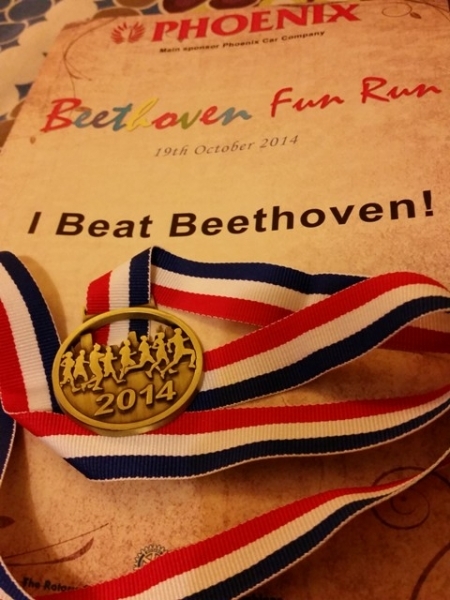 I was meant to be running the 3rd annual Beat Beethoven Fun Run with friends, but over the days before they cancelled on me one by one. And then my transportation plans failed me one by one. It just seemed that I was alone in the world and there was nothing positive to make me face the day. I just wanted to stay home and sulk. I wanted to stay home and feel sorry for myself. But, I forced myself out of bed. And before I knew it, I was in Stirling for the race. The skies began to clear and the rain dried up. And my friend arrived with her daughter just in time to see me start the race. The skies remained clear for the rest of the day as I visited with my friend in her home and my soul began to warm in the glow of friendship and laughter. It was nearly 7pm by the time I finally got home, but I was feeling good; I was feeling energised. Yes, I woke up wishing I hadn’t, but I ended the day so glad I did. I beat Beethoven, I beat my 5K record, and I beat my blues—all in one fabulous day. * My best-ever 5K time was 17:31 back when I was 17. This was my best time since getting back into running in my 30s, post-ITP diagnosis. Woo Hoo! I’m so glad you got it all sorted and that you went to the Beat Beethoven Fun Run. Hooray for best-ever times and Hooray for friends! Wish I could have been there to cheer you on, too. Perhaps another time. It was a good day and I am glad I went. Sunday travel when you’re relying on public transportation is just so frustrating that it makes me want to stay home! Oh well… It was well worth it! !